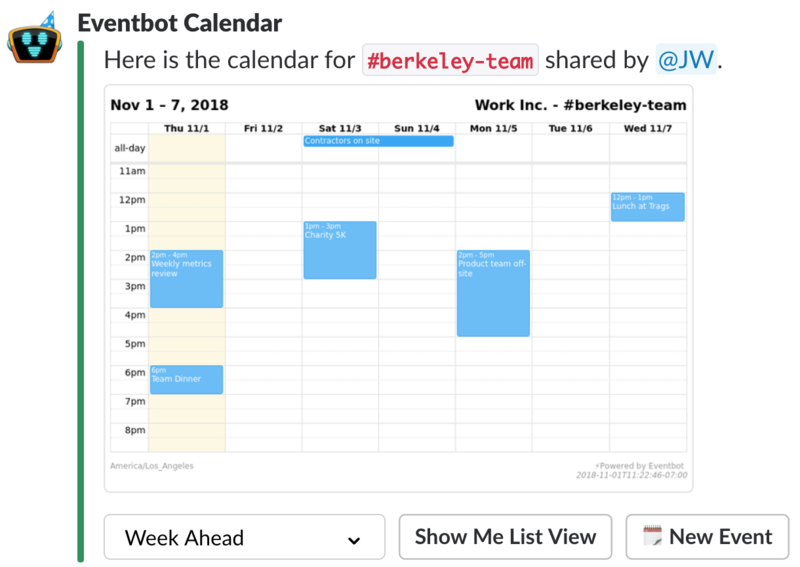 We started Eventbot to create an entirely new group calendar experience inside the Slack. One of the most challenging aspects of that mission has been letting folks see their events on a visual calendar view. It’s been our #1 most requested feature, so we’ve tested out numerous ideas over many months. However, Slack is primarily a text-based chat environment, so showing a calendar required us to get creative. We’re happy to say we’ve found a solution that lets you see your calendar of events, directly inside Slack! Today we launched the visual calendar view inside Eventbot! When you type /events, you’ll see a new button labeled “Calendar View”. This will replace the list of events, with a visual calendar image. We’ll generate this image on-demand, so you’ll have the most up to date view of your events. You can see all this privately in Slack, but you can also choose to share the calendar view to your whole channel. This makes it easy for everyone to see what’s happening in your Slack team. You can also switch calendar views to visualize two-days ahead, a week ahead, or a month ahead! We’ve designed the calendar view to be flexible, showing you just the right amount of hours and days based on your events. The calendar will even show your recurring events, so it’s a great way to keep a schedule for those weekly standups, or monthly check-in meetings. The week and month views are available on a paid plan (which you can always try out for free). The visual calendar view will evolve over time, but we’re proud to have built something that (we hope) you’ll love. Please send along any feedback you have - we’re truly building a bot you’ll love so let us know what you think 💌!